Written on June 30, 2008 by Kevin. We made the decision recently to remove the Crib Tent from Kaitlyn's crib. We felt it was no longer necessary as we will be moving her to a big girl bed as soon as she is walking well. We removed the tent and gave Rylan a firm warning that he was to not throw any toys into her crib. We explained that she could stand on them, climb out and then fall and hit her head. He understood this and as of now, has not placed items into the crib. My wife did however find the following situation a few days ago. Rylan has listened as to not throw toys into the crib but since we did not mention anything about him climbing in, he was fully interested in giving it a try. He mastered it while we slept with a light ear to the baby monitor. No abnormal sounds but sure enough, Rylan was in. They couldn't have been more happy sitting there together when she came in. When my wife woke up she heard Rylan saying "No Cry Kaitlyn. Mommy's coming." over and over. He apparently climbed into the crib to comfort her. He can be an amazing brother when he wants to be. Written on June 27, 2008 by Rylan & Kaitlyn. Another week has come to an end. Kaitlyn's birthday and party are just around the corner and she hasn't started walking just yet. We are all really anxious to see her running around by her birthday in her cute dress and hair bows that our mom is making. She is going to be getting a lot of neat gifts. Speaking of hair bows, we wrapped up another craft show last Saturday. It was fun and despite it being super hot outside, it wasn't too bad. It was a bit of a disappointment though because the little girl selling lemonade wasn't there this time. I did get a few cupcakes though and when this one lady brought over tiny apples, me and Kaitlyn kept busy. We both just ate them whole, taking bite after bite. Kaitlyn did really well. Our mom and dad thought it was funny because I really ate the entire apple, middle part and all. No one told me that it wasn't normal. Our mom did really well at the show and we are really looking forward to next month. We really need to get out of these hot months though when the crowds will really pick up. Let's see. We headed to a small baby expo last weekend as well. They had a booth of toys that I really was not interested in being pulled away from. Mom dress Kaitlyn in her tutu and everyone loved it. I think Kaitlyn became the highlight of the expo. They had a blow up bouncy thing that I was too nervous to go on. I got 3/4 of the way in and had to back out. It was just too scary. We are heading to another baby expo tomorrow so maybe they will have a bouncy thing that I can try again. Mom has been working with me on doing crafts during the day while Kaitlyn sleeps. It has been really fun all of those things. We have a box setup now for me that includes feathers, markers, tape, ribbon and a whole bunch more. The possibilities are endless. To wrap things up, Kaitlyn and I want to thank dad for a wonderful dinner last night. He made a baked pancake meal which included hash browns and blackberries. It was super good. Kaitlyn and I both ate up our entire dinner. Our dad is the best cook around, well right behind mom of course. That's this last week in a nutshell. Have a good weekend everyone. Written on June 24, 2008 by Kevin. It looks like Kaitlyn has started having a crush on the Jonas brothers. This is the super popular band of brothers that is everywhere right now. They recently started showing the Camp Rock movie and ever since then, Kaitlyn has been going nuts. Now whenever she sees them on television, she gets excited, smiles and occasionally dances. Written on June 23, 2008 by Kevin. With Kaitlyn's birthday coming up in just under 2 weeks, we are trying to make sure we plan everything so it goes well. Over the year, we have noticed a good list of things that Kaitlyn appears to be allergic too but the big one of course was milk. We wondered what exactly we were going to do for her birthday cake if she couldn't handle it so we decided to do some testing(with the doctor aware). We have been testing her with cupcakes at our local grocery store. They have a dairy free whipped topping that we can happily say that she does not appear to be allergic too. 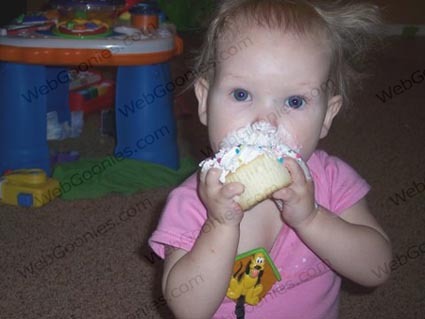 We tested a bit of it on her back and when that showed no bad signs, we let her devour a full cupcake. It was a mess but the pictures are priceless. 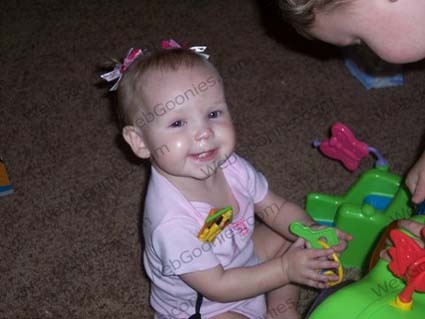 For those looking at the picture and noticing her crazy hair, she was wearing pigtails that day and we had just taken them out. Her hair is long enough for the bows but too short to release the shape. She's a fun one. Written on June 20, 2008 by Rylan & Kaitlyn. Tomorrow we are going to a craft show and we are going to have a lot of fun. It's going to be a hot day but we will be parked under the trees and our big tent. The lemonade stand will likely be hot spot for me and I think I can share a few baked goodies with Kaitlyn now. The word is that my Grandma is coming as well which is going to be fun showing her the petting zoo. Let's see what happened this week. Well the chocolate factory visit was pretty fun. The tour was not what my dad or I thought it was going to be but I really had a lot of fun dreaming about those big chocolate pieces. They even had a 500lb Santa mold which I would have had fun eating. I do like going to the factory though and eating some fresh chocolate. It is definitely a special treat. Kaitlyn may have been sick this week but it certainly didn't stop her. She was moving around like any other day. In fact, she took her first couple of steps the other night. I was very proud of her. She is a good sister to have. Mom has to give Kaitlyn eye drops for her pink eye and while Kaitlyn is crying, I like to try and soothe her by finding some of her favorite toys. Sometimes it helps a lot. Sometimes she just screams at me. Ey yi yi. Kaitlyn and I are excited about the Camp Rock movie on the Disney channel tonight. They have been showing commercial after commercial and now I am really looking forward to it. It looks like it will be a good movie. Oh ya, we had a lot of fun with dad on Father's Day. Kaitlyn was super cuddly and our dad really liked that. The day before, we headed over to our Aunt's house and had a swimming party with our Grandpa and Grandma that have been out of town. It was nice to see them and then go swimming. We need to get back to preparing for tomorrows show. We need to break open our piggy banks so we can buy some lemonade. It was yummy yummy last time. Have a fun weekend everyone. Written on June 19, 2008 by Kevin. Kaitlyn seems to have gotten a case of pink eye. We are not sure where she got it from but she is doing amazingly well. It must not be itching because she isn't rubbing her eyes. This should help minimize the chance of spreading it from one eye to the other. We are now having to be extra careful not to get it ourselves which is super fun. This pink eye comes during the middle of her first cold. She was coughing a few days ago and the other day it became very mucousy sounding. She woke up the other morning and freaked Rylan out so much that he was yelling for their mother to come into their room quickly. Rylan was super worried because of the crazy coughs. Despite all of the times he has pushed Kaitlyn, he definitely seems to worry about her. Kaitlyn almost managed her first year without a cold but this one sure has packed a punch. Even with the boogers covering her face and her red eye, she is still the cutest little girl, with a huge smile. Written on June 18, 2008 by Kevin. Yesterday, I returned home early to help take care of Kaitlyn who was experiencing some crazy congestion, causing her to cough pretty violently. We took her to the doctor and then headed home to rest. Kaitlyn spent the rest of the day in a boogery state but otherwise in a good mood. Since I was already home, we decided to make the best out of the day and give Kaitlyn a bit of a break by having Rylan and I head to our local chocolate factory. Yup, a real chocolate factory, here in Arizona. Rylan and I drove to the factory and waited a bit for the next tour to begin. 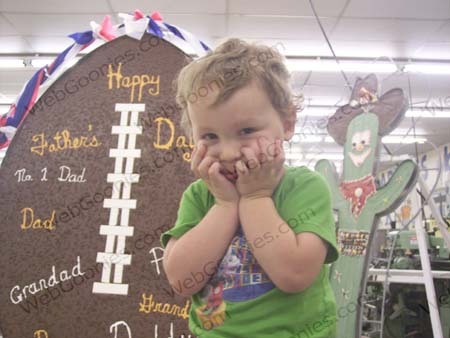 I had a chance to show him a huge 500lb chocolate football display which he loved. He of course told me that he wanted to eat it. How long would it take you ask? Only 2 days according to Rylan. The Cerreta Chocolate Co is family run, even after 70 years. While I was showing Rylan what I could before the tour started, one of the grandfathers came up and gave us a bit of caramel to try. As expected, Rylan loved it. The tour began but unfortunately it was nothing more than a lady speaking about the company over a, hard to understand, speaker system. No actual walk through which I found a bit disappointing. The tour did offer a few chocolate samples which Rylan certainly wasn't going to turn down. He did not like the chocolate covered lemon cream but loved the tiny cactus shaped chocolate. We ended the visit by purchasing a few things. It's always fun to have Rylan pick out his own goodies. During our first visit, he asked for some soccer ball chocolates. The best they had were tiny football shaped ones. He was most satisfied with the 6 of them that he asked for. This time around, he went for a white chocolate covered pretzel stick. He sat patiently in the car waiting to dive into it. For likely the first time, he ate his chocolate slowly and meticulously. We definitely had fun, despite not being about to actually walk around the factory. It is one of those places that the kids may grow up appreciating that they had near them. I imagine most kids cannot say the same. Written on June 16, 2008 by Kevin. 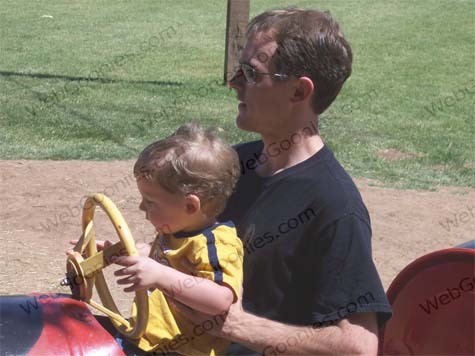 I have to say, Father's Day 2008 was pretty amazing. The kids let us sleep in a bit while they kept busy in their room. Rylan loves to read books to Kaitlyn in the morning. Rylan and I did a bit of coloring in the morning and he chose the coloring book called "I Love You Father" which was obviously perfect. Kaitlyn gave me a great gift of hugs and kisses. While laying down, Kaitlyn cuddled up with me in between playing peak-a-boo. It was amazingly fun and I couldn't have asked for anything more. The kids gathered up a bit of money though to get me a small gift. This year I received the old 80's movie Short Circuit. This was on my list of movies that I wanted because I grew up with them and wanted to share them with the kids. Rylan immediately took to it because the robot looks like Wall-E, from the upcoming Disney Movie. This Father's Day was great. I don't know how the kids are going to top it next year. My birthday, earlier this year, was filled with crying kids in the back of the van but Father's Day was filled with giggles and hugs. It was perfect. Written on June 13, 2008 by Rylan & Kaitlyn. We are now another week closer to Kaitlyn's birthday. Mom ordered her some really nice decorations and they came in this week. Everyone is pretty excited about the upcoming day. Kaitlyn is going to look super cute in her dress. Let's see, we hung out at the farm last weekend which was pretty neat. It was super hot though which certainly was no fun. My dad took me into the petting zoo but I was not OK petting any of those crazy animals. They are very interesting to watch though, with a very careful eye. For Fathers Day, we are heading over to my Aunt's house where we will be meeting up with my Grandpa. He is back in town from Washington so it's going to be exciting to see him. I think the plan is to have a BBQ and go swimming. Kaitlyn and I sure had a lot of fun when we went swimming at Grandma's house. Kaitlyn took a first step the other day. Of course, she took one step, held for a moment and plopped to the ground. It's tough making that first and second step. I know she will be running around in no time though. 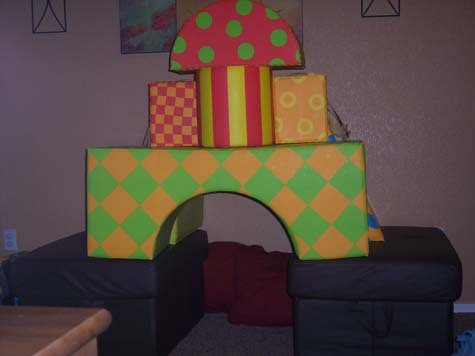 Dad made us a fort the other day and it really is fun. Yesterday, my mom caught Kaitlyn and I inside of it both giggling. She thought it was super funny. Little did she know that we were plotting a master plan of attack. Muhahah! That's it. Have a good weekend everyone. Visit to our local farm.. Written on June 9, 2008 by Kevin. I am always trying to find affordable ways to spend our weekends. This is difficult, especially during the summer time when its already 110F early in the morning. I see many lists of great ideas however most of them just don't work here in Arizona. Where am I going to find a farm to go to? Well, it turns out I was wrong. 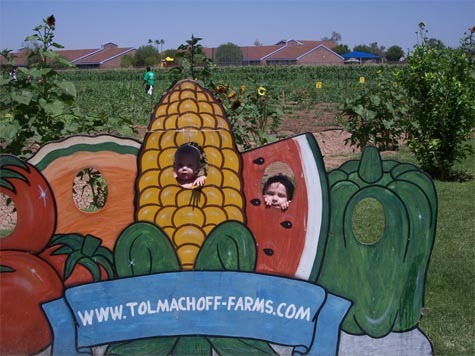 I came across a parenting website which had a calendar of events and it turns out there is a local farm just a few miles away that happened to be having their opening day over this past weekend. We made plans to check it out and try and fight off the heat. Rylan was immediately excited when he saw the lady bug train. This was his first try on one of these and he loved every minute of it. They dragged us around a part of the farm and Rylan said 'Whoa!' the entire time. 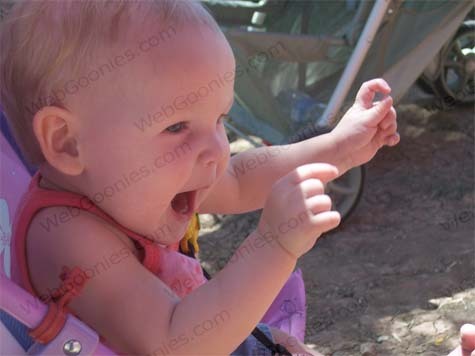 While there was not too many events for little kiddos, the picture below shows Kaitlyn having a great time. We had a chance to grab up a few fresh foods which we will be sampling with Rylan soon. We wanted to pick our own vegetables but it was just too hot. We headed home before the kids melted to the ground. Written on June 6, 2008 by Rylan & Kaitlyn. There hasn't been too much going on this week however last night we had a bit of fun. My dad decided that we would make shaving cream artwork. He sprayed out a bunch of shaving cream into a dish and then he let me put food coloring in it. I spread it around and then we placed a piece of paper on it. I like pulling it off the foam and looking at the neat designs. Now we have a bunch of neat things to hang up on our bedroom walls. It was a fun project. The rest of the night wasn't too fun though. Mom made dinner but I just wasn't going for it. To make matters worse, my mom made cupcakes to eat afterward but they were insisting that I had to eat some of my dinner before I was to get a cupcake. Boy that cupcake sure would have tasted yummy I bet. It even had pink frosting on it. Mom and dad signed us up for a whole bunch of craft shows. We have one in 2 weeks which will be exciting. Last time they had this lemonade that I kept wanting. They also had the petting zoo which was neat to look at. I am pretty sure that they are coming back again. Kaitlyn and I went swimming at our Grandma's house last weekend. It was Kaitlyn's first time swimming. We both had fun. Later, dad grilled up some burgers. Kaitlyn had a chance to try her first cupcake. Speaking of treats, we headed to our local chocolate factory the other day. Unfortunately they weren't doing any tours that day but I got to choose some candy to buy. I went with the little chocolate footballs. I told my dad that I would like 6 of them, and he did just that. Mom got a chocolate covered cheesecake slice. I don't know what our dad was thinking when he bought and ate a chocolate covered jalapeno. Crazy dad. Oh, our Grandpa just walked in the door. Time to go. Kaitlyn has to show Grandpa how she climbs over everything now. Have a good weekend. Written on June 5, 2008 by Kevin. Arizona has finally hit the $4.00 mark in gas prices. We luckily were one of the last states. It was just a few years ago that we had a gas shortage and when a few gas stations bumped themselves up to $3.00/gallon, people were furious. Now, the prices at $4.00, people just have to move on and deal with it. The minivan that we drive is definitely not easy on the gas. Throw in the fact that we run the A/C to keep the kids cool, we go through it quickly. A full tank cost atleast $90.00 so I quickly learned some driving techniques to try and assist with the gas mileage. Unfortunately they don't seem to be helping much. The main thing that I now do is simply slow down. I have now become one of those drivers who drives the speed limit, rarely higher. When I clearly see that I am not able to get to the green light up ahead, I let off the gas and basically coast until it finally turns green again. This is done with no one around mind you. What I have noticed though since changing my driving habits is that I am beginning to see other drivers going slower as well. I would be very curious to see if the accident statistics change as gas prices continue to increase. With people hopefully slowing down to conserve the precious gas, will there be fewer accidents? I can certainly welcome that result of the gas prices. On a side note, I now get a good laugh when I see people flying by, only to get stopped at a red light. People weaving in and out of traffic now seem to be rare here and I can just tell everyone is looking at them funny as they whiz by throwing away the money. Personally, I would much rather spend our money elsewhere. To the top she goes.. Written on June 4, 2008 by Kevin. There are little things that we notice that are different between Kaitlyn and Rylan at a certain age. At this time, Rylan was basically walking and while Kaitlyn is just about there, she still needs to take that first step. She has however mastered the art of climbing. With Kaitlyn, we now have a 2 sets of the Parents Block Party blocks from Target. These seem to have really helped her with improving her climbing skills. These blocks are of different shapes and sizes and it gives her a good assortment of difficulty levels. She can just about climb onto any of them now without too much hassle. There have been many times now that we turn our head and she is sitting on top of her blocks with the biggest smile. She is able to slowly work herself down in many cases also which is a big relief. Rylan of course loves the blocks for climbing but he also likes to make houses with them as well. This entails stacking multiple blocks on top of one another. Of course Kaitlyn sees this as a challenge. She is relentless on trying to get to the top. Except for the hands of mom or dad, nothing can stop her from getting to the top, not even short tumbles. She brushes herself off and heads back up. Written on June 3, 2008 by Kevin. 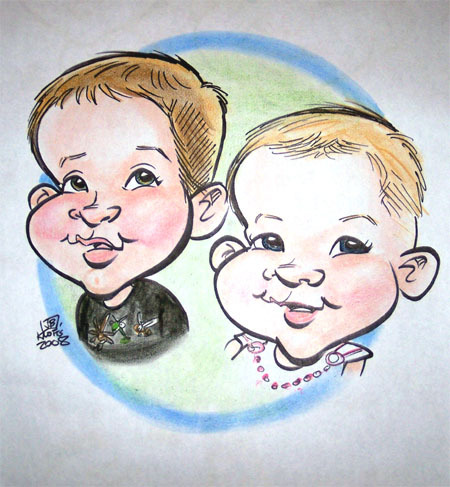 When we headed to Knott's Berry Farm with the kids, we decided to pickup a caricature of the kids. This is one of those things I would normally pass up but I am glad that we got it. It's something funny to show them when they get older. I tried to upload a video of the actual procedure of the artist drawing the kids but YouTube was having a bad day. It was a pretty neat thing to watch. He even drew in the bugs that were on Rylan's shirt.